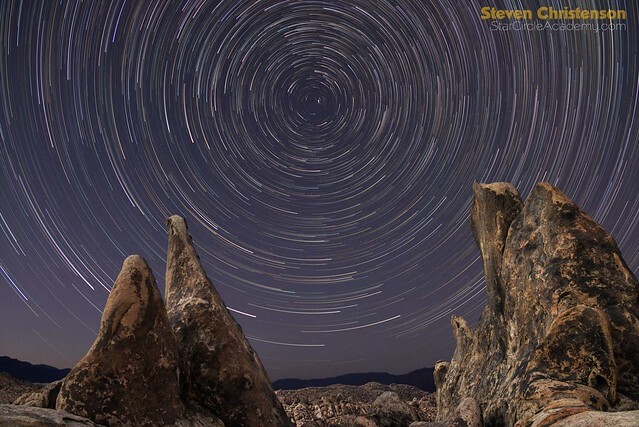 Want to capture Perseid meteors, the Milky Way, and star trails in an awesome location? 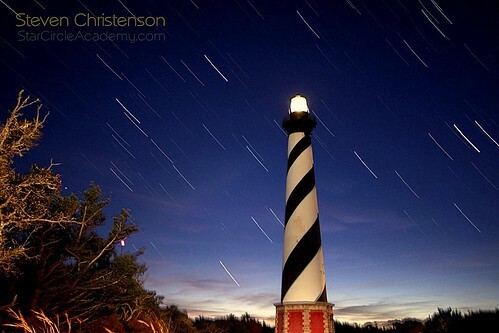 The results obtained by shooting a long exposure at night depend quite a lot on which direction the camera is pointed. I favor long star exposures with a northern view for many reasons. 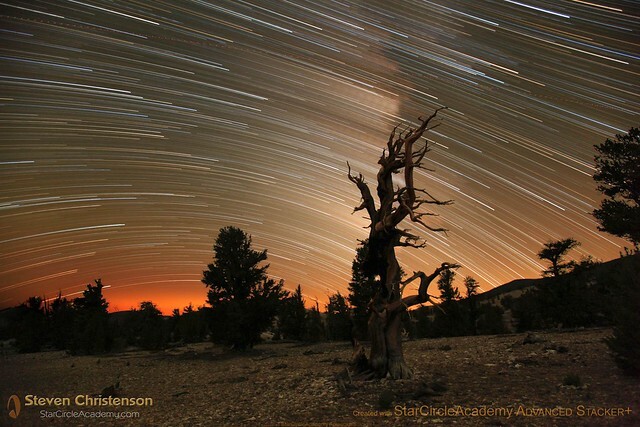 Curvature of the star trails is strongest around the north star. Exposures of about 6 hours will appear to be full circles (24 hours of exposures are actually needed to make complete circles and that is not possible in one night except near the North Pole!). With just a smidgen of star hopping skill it is easy to find the north star which, weather permitting, is always visible in the night sky. The moon sweeps east to west giving long shadows from the right or left of the subject. And when the moon is highest in the sky it can cast strong face light. Since the moon cannot enter into a northern shot a photo can be made regardless of the moon’s phase and for as long as I choose. For shots toward the East, South or West it is important to know the moon phase and location during the hours of shooting to prevent problems from flare or washout. [NOTE: those in the southern hemisphere still have to worry about a moon in their Southern shots]. 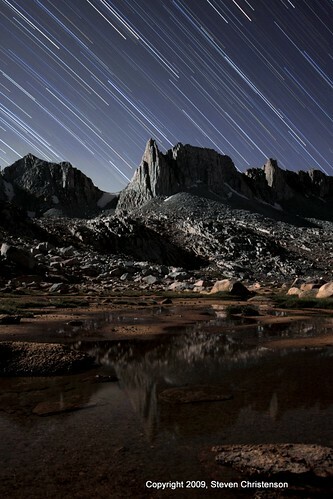 The stars in the north move the slowest through the field of view which allows them to be brighter and reduces inter-exposure gaps in the trails. If I know my latitude I know how high to point the camera and be guaranteed to get a circle in the view. I do not need to know what constellations will be visible in the direction I will shoot. Two major meteor showers (the Perseids and Quadrantids) and 3 periodic meteor showers (the Giacobinids or Draconids, the Ursids and the Andromedids) are well placed in the northern sky. Not every situation lends itself to a view from the south. It takes a longer exposure to form a pleasing arc. To get a circular arc, I must include at least 10 degrees or so above and below the North Star. The farther north you are, the higher in the sky the center of rotation. Those at more northerly latitudes will be more constrained in their choices. The altitude (degrees above the horizon) of the north celestial pole may constrain the choice of lenses to very wide-angle – and may force you to use portrait mode. Or you can create your exposure by stitching together foreground and sky shots. Looking North from Grandview Campground, White Mountains, Bishop, California. Shot at ISO 800, f/3.2 for 6 minutes each. Began at 10:11 PM and ended at 5:35 AM. That is 75 shots x 6 minutes = seven and a half hours. Grandview is at latitude 37 degrees North, so the center of the circular pattern is 37 degrees above the horizon. 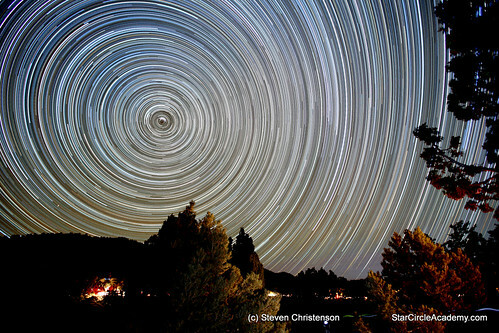 Contrary to popular belief, Polaris, the North Star, is not the brightest star in the sky. Sirius is the brightest star. The brightest objects in the night sky are the moon, and the planets Venus, Mars, Jupiter and Saturn. Also while Polaris is quite NEAR to the North Celestial Pole, it’s not exactly there so even Polaris will make a trail. This is a reissue of an article originally written in October 11, 2010; Thoroughly revised and updated. 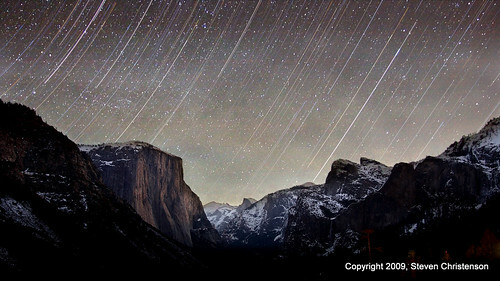 This entry was posted in Creativity, Gaps in Trails, Photo Tip, Stacking, Star Trails and tagged Andromedids, arcs, constellations, Draconids, exposure, gaps, gaps in star trails, meteor shower, noise, noise reduction, North Star, Northern View, Perseids, Polaris, Quadrantids, Star Circles, Star Trails, Ursids on April 30, 2018 by Steven Christenson. This entry was posted in Gaps in Trails, Noise Reduction, Photo Tip, Stacking, Workshop and tagged Andromedids, arcs, constellations, Draconids, exposure, exposure problems, gaps, gaps in star trails, meteor shower, noise, noise reduction, North Star, Northern View, Perseids, Polaris, Quadrantids, sensor damage, Star Circles, Star Trails, Ursids on October 11, 2010 by Steven Christenson.